The jury consisting of 13 members: Bénédicte Kurzen (Jury Chair), Jim Casper (editor-in-chief at Lensculture), Máximo Panés (editor-in-chief at Dodho Magazine), Maral Deghati (Manager Education at the World Press Photo Foundation), Ana Frangovska (curator at National Gallery of Macedonia), Damir Senčar (Picture Editor/Photographer at HINA, Croatian News Agency), Marko Marinković (freelance photographer), Imre Szabo(photojournalist), Burim Myftiu (photographer), Senad Šahmanović (movie director), Aleksandra Nina Knežević (designer), Ahmed Burić (journalist and writer), Miro Majcen (photographer), has made a selection of 90 photographs (50 photographs in 10 categories, i.e 5 photos per category; and 40 photographs in the category of photo story/reportage, i.e. a total of 5 best photo stories), which will be exhibited in the National Gallery of Bosnia and Herzegovina on January 26, 2018 starting at 7PM. This year’s Grand Prix Award is a dSLR camera Canon EOS 5D MARK IV, a gift from Festival’s general sponsor Canon Bosnia and Herzegovina. 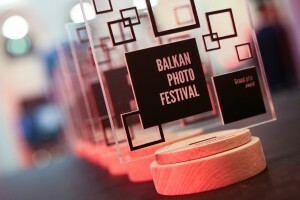 For special recognition on the competition, our golden sponsors prepared gifts, camera Canon EOS 77D by AvteraBH, and camera Sony α6500 by Sony Bosnia and Herzegovina. (The jury assigned these three awards to 3 of the 11 category winning photographs). Burim Myftiu, Imre Szabo, Maral Deghati, Danijel Berković, Mare Milin, Zoran Marinović, Petar Sabol, Robert Belošević, Adnan Bubalo, Anel Alijagić. Who will select the 2017 Balkan Photo Award winners?